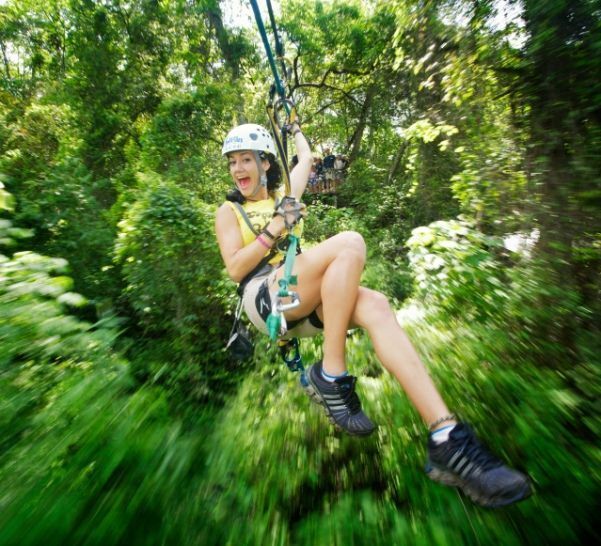 Ziplining in Riviera Nayarit; photo courtesy Riviera Nayarit CVB. Sea Turtle Release in Riviera Nayarit; photo courtesy Riviera Nayarit CVB. The San Francisco mural on the square in San Pancho is made of bottle caps. 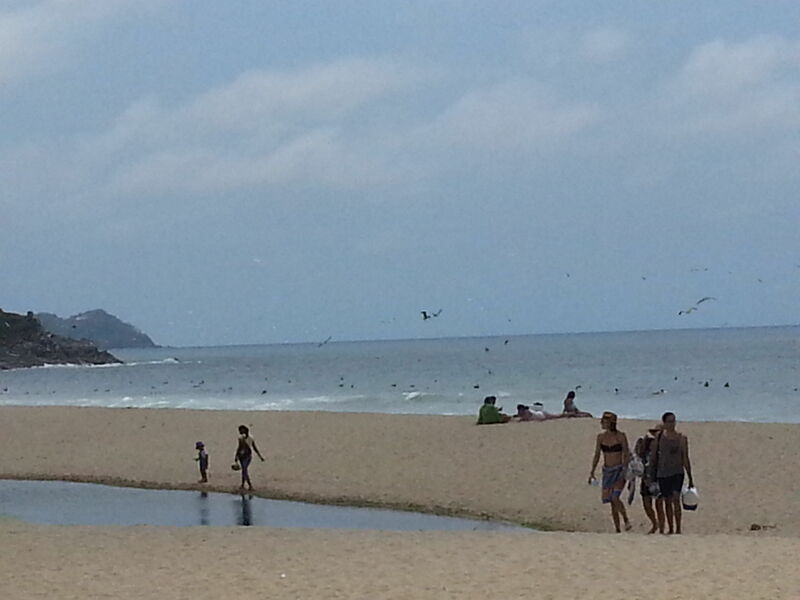 The beach at Sayulita attracts many families with its calm, warm water and gentle surf. From the hip resort of Puerto Vallarta to the jungles of the Sierra Madres, Mexico’s Riviera Nayarit offers activities to everyone in the family, and at bargain prices. Riviera Nayarit is the lush coastal region of Mexico’s Nayarit state, extending from the gated resort community of Nuevo Vallarta (pronounced No-voh VY-ar-tah) north to the San Blas peninsula. Families will find diverse cultural and environmental riches as well as nice beaches facing the calm, shallow Banderas Bay. Although the region shares an airport with the established beach resort of Puerto Vallarta farther south, it has a greater abundance of eco-adventures. It boasts a mild tropical climate that averages 80°F (27°C); however, it can be very hot and humid during the summer rainy season and cool on winter evenings. Here’s a look at what to do, from south to north along the coast. This purpose-built enclave of contemporary beachfront resorts is a 15-minute drive or a water taxi away from Puerto Vallarta. The boat pier is at the Paradise Village Marina, just part of the facilities at this huge, family-welcoming resort complex. Since Nuevo Vallarta is a planned community of hotels and condominiums, there’s not much to see or do, but we can recommend a fine seafood restaurant that is worth a stop. Laguna Tino’s (322/ 29 702 21) at Blvd Nayarit #393 Nuevo Vallarta is on the entry road and it’s open daily for lunch and dinner. Although a parallel highway from the Puerto Vallarta International Airport now cuts the drive time to popular Punta de Mita, we still love scenic Route 200, a two-lane blacktop, well paved with minimal traffic. Using a bit of Spanish, a good map and a rental car -– or a car and driver from Tropical Incentives as we did — families can have fun days out and meet the locals. Heading north from Nuevo Vallarta, you’ll come across Bucerias first, a hip town where those who work in the region’s tourist trade can afford to live. And live well, they do. This tiny fishing town is a popular spot for shopping and dining (Mark’s Bar & Grill is terrific). Each January, Bucerias is the setting for the “Virgen de la Paz” festival which includes the blessing of the local fishing fleet. La Cruz de Huanacaxtle is a nice place to stop for a fresh seafood meal or a stroll on the beach. At our first visit, from Route 200, you could see the barren tree struck by lightning whose remaining limbs formed a cruz or cross. This bayfront town has grown quickly since a government-sponsored marina and residential complex were built, with development that also lured a lot of expatriates to settle. Every Sunday, there is a Farmer’s Market as well as an art n’ crafts market selling crafts and international cuisine; the daily fish market opens at 7am for the catch of the day. The Puerto Bahia Resort and Spa complex is one of many hillside clusters whose guests have brought SUP schools, windsurfing, boating, sunset cruises, deep sea fishing, ATVs and horseback riding facilities to the region. Punta de Mita is a small town located at the northernmost point of Banderas Bay, where the Pacific Ocean and the Sea of Cortes meet. The region is best known to Americans for the Four Seasons Punta Mita, which dominates the huge gated Punta Mita community outside town. The complex now has other hotels (including the new St. Regis Punta Mita), private residences and condominiums, the private 7,014-yard Jack Nicklaus Signature Golf Course at the Four Seasons, and myriad other golf, tennis, SUP, watersports and recreation facilities. Punta de Mita beaches are fine, white sand with close-in coral reefs; deep sea fishing, whale watching and surfing can be enjoyed nearby. The open-air restaurants along the coast are popular weekend destinations for Mexican families, who drive up, enjoy the beach and dine on fresh seafood and refreshments. There are also many small hotels, surf shops, snorkeling and dive equipment rentals, tours by boat and places to horseback ride. Litibu is being developed by the government of Riviera Nayarit, and is home to the popular Iberostar Playa Mita all-inclusive resort with more resorts and hotels to come. Sayulita is a well-known surfing destination for West Coast families, and it’s grown in scope and sophistication since our last visit. This artsy, hippie community is packed with toes-in-the-sand cafes, funky beach shacks, luxurious private villas and day spas. There’s great shopping for leather goods, shoes and clothes, in addition to many crafts shops selling new and traditional Mexican handiwork. From plaster day-of-the-dead figures to political T-shirts, your family will find it all in Sayulita; remember that prices descend as you walk inland from the beach. One intriguing shop we visited is Galeria Tawana Sayulita, a center of Huichol crafts that helps support the indigenous Indians by selling their beaded artwork and jewelry. In the autumn high-surf season, the town is especially popular with young singles from Southern California, but it’s a fun daytrip from other Riviera Nayarit towns any time. All year long, visitors can take stand up paddleboarding and surfing lessons right from the beach. If you decide to stay awhile like we did, settle in for some fabulous seafood at the waterfront Don Pedro’s, whose second floor tables have a wonderful sunset view. The restaurant was founded by two California surfers who fell in love with this town, and that feeling permeates their cuisine and presentation. If they have any in the cellar, try the Casa Madero wine that is grown and aged in Mexico. For overnight stays, one friend recommended Villa Amor, a striking collection of thatched palapa buildings on a hillside above Playa los Muertos beach that’s known for its romantic ambiance, friendly staff and great water views. San Francisco (locally known as San Pancho), just 30 miles north of Puerto Vallarta in Nayarit, is home to a notable Polo Club between November and May. In addition to the charms of what appears to be a traditional Mexican village of about 1,600 residents, the town boasts outfitters who arrange horseback riding, diving, climbing, yoga and jungle excursions. Allow time to walk around the narrow streets; San Pancho’s large ex-pat community imbues it with a sophistication that supports many fine restaurants and shops. Don’t miss the enormous outdoor mural in the town square made of bottle caps, it’s very impressive. One particularly intriguing hotel is Cielo Rojo, a stylishly restored home with nine rooms, two of them suites sleeping four. Located on a quiet street just a few minutes from the town square, it’s an intimate hideaway with great design, modern Mexican paintings, classic antiques, and an organic restaurant and wine bar. Families will find many gluten-free and healthy dishes, homemade tortillas, and even an artisanal tequila made by the hosts. There is a lot to do near San Pancho, making it a great base if you want to be off the beaten track but in a stylishly ex-pat Mexican community. The local Entre Amigos cultural center offers children’s art classes and more arts programs; there is surfing and other watersports nearby, and the local tour operator Vallarta Adventures runs trips out to Hidden Beach, a cave formation in Las Marietas Islands that hides its own sand beach. Farther up the coast is pretty Lo de Marcos, said to evoke the Riviera Nayarit of 30 years ago. This fishing village’s broad stretch of beach is being talked about by resort developers; at present, there are some Mexican markets, a few small hotels like El Coral, snack bars and a golf course. Rincón de Guayabitos is more fun, and the colorful boats moored in its half-moon harbor give it a Mediterranean charm. There is a brightly painted outpost of the Decameron all-inclusive hotel group, making Rincon a center of low-budget and off-the-beaten path family tourism. This port is said to be an excellent base for serious fishermen, and families will appreciate that Grupo de Ecologistas de Nayarit hosts sea turtle nesting camps nearby. Families with school-age kids will enjoy the two-day excursion we made to San Blas, the colorful small town where Junipero Serra, founder of the famous California Missions, was born. San Blas and the village of Matachen are gateways to La Tovara National Park, a mangrove region that houses hundreds of bird species, read an account of a San Blas weekend here. Known as the region’s official mascot, four protected species of tortugas (leatherback turtles, Olive Ridley turtles, hawksbill turtles, green turtles) make Riviera Nayarit their home. Families can watch these noble creatures come ashore to lay eggs in the sand (June to September) or assist as the tiny hatchlings break out of their shells and return to the sea (August to November). On every beach, local volunteers and hotel security patrol each evening to be sure that nesting turtles are not disturbed by passersby, and that new nests are marked so the eggs can be relocated for safekeeping. Wildlife Connection, an eco-tour group based in Marina Vallarta, offers an evening tour between July and March so that visitors can participate in the release of baby turtles and learn more about their conservation. The local Project Tortuga group, Grupo Ecologico de la Costa Verde, runs a marine turtle nursery in San Francisco and sometimes conducts an educational slideshow at a local hotel. They have long term volunteer positions, as does biologist Oscar Aranda who served as our wonderful guide with the Sociedad Ecologica de Occidente. Families visiting between November and April can see humpbacked whales as they migrate south from the Arctic to raise their calves in the protected waters of Banderas Bay. Vallarta Adventures offers a variety of whale watching tours appropriate for all ages and physical abilities. Two great, kid-friendly daytrips are offered by Vallarta Adventures, one of the most experienced adventure tour operators. A good day-long Off Road Adventure expedition covers the Sierra Madres region pretty well for less active families, courtesy of a converted Mercedes diesel truck. 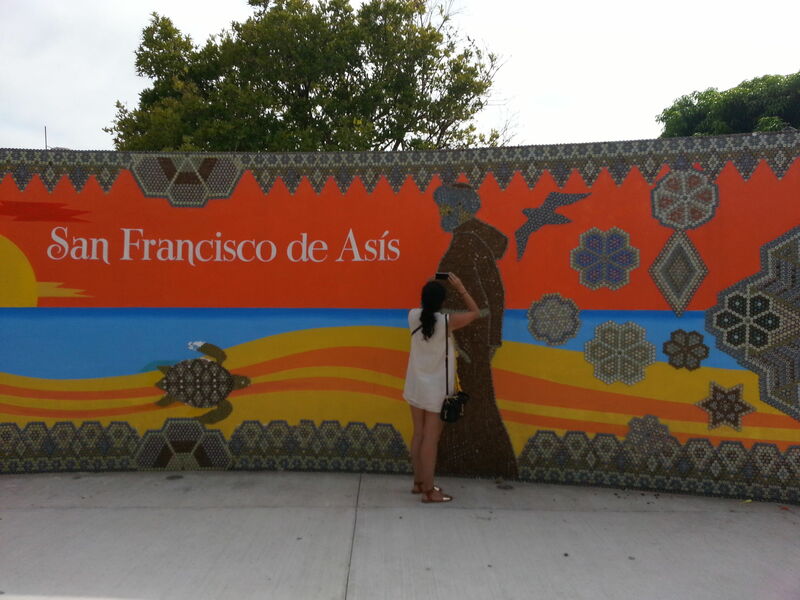 En route, well trained guides relate Mexico’s history and the culture of its indigenous Huichol Indian tribes. One of the day’s highlights is a stop at a local home where families can watch tortillas being made on a grill, then eat them with fresh guacamole and salsa. Guides lead a brief nature walk through forested land to talk about plant life, insects and the forest ecology. After the walk, the truck parks near a private beach at Punta Monterrey, for a barbecue and swim in the active surf. Lots of tequila is passed around on the ride home, but we found it all in good fun. Energetic parents and teens will enjoy this company’s Outdoor Adventures multi-sport day much more: begin with a speed boat ride to a Banderas Bay beach, where you mount 4×4 Unimogs (like ATVs) to ascend to a mountainous base camp. From here, you can snack, hop on a mule, and journey into the sub-tropical forest for a zip line tour, some rappelling down waterfalls, and lots of wet fun. For a variety of other hotel choices in the region, see our Riviera Nayarit Hotels & Resorts Guide.